I do not have much experience with Rohrer and Klingner. 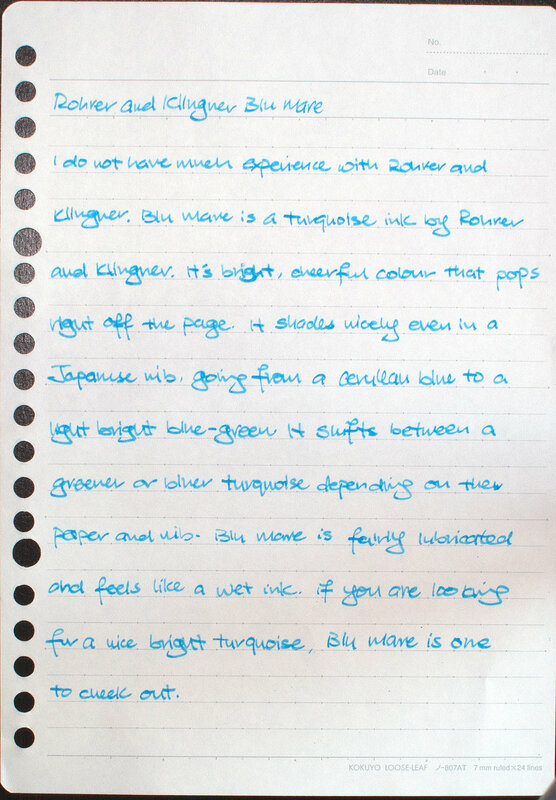 Blu Mare is a turquoise ink by Rohrer and Klingner. It’s bright, cheerful colour that pops right off the page. It shades nicely even in a Japanese nib going from a cerulean blue to a light shade bright blue-green. It shifts between a greener or bluer turquoise depending on the paper and nib. Blu Mare is fairly lubricated and feels like a wet ink. If you are are looking for a nice bright turquoise, Blu Mare is one to check out.